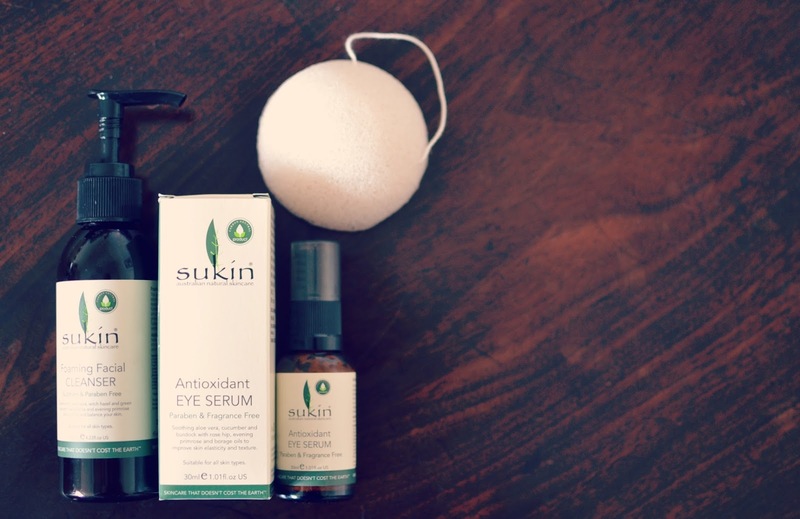 Since discovering the Sukin brand which I talked about in this post, I have been really interested in trying out some other products by the brand. I have been using the cleansing gel for a few months now, and absolutely love it, but I've been trying to avoid stockpiling products and using up what I've already got, so I'm yet to try any of the moisturisers or masks. However, I recently ran out of eye cream, so it was the perfect opportunity to pick up a new one - and Sukin have an eye serum in their range, so I thought I'd give it a try. My usual skincare routine involves removing my makeup and then cleansing using this foaming gel cleanser on a konjac sponge. The sponge is super exfoliating and helps the cleanser to work into the skin. I find that this takes off any makeup residue and leaves my skin feeling really clean and smooth. The gel is so bubbly and foams up really quickly - you hardly need to use any, which means it lasts ages. I have just bought a second bottle as I love it so much - it doesn't strip my skin or dry it out, which is really important. I also love the eye serum, which is a light lotion. This, again, lasts ages as a tiny amount goes for miles, so for the £15 price point it is such good value. Using my ring finger, I pat it on around the orbital bone and around the corners of my eyes to help combat crows feet - it's definitely made my skin feel smoother and more intensively moisturised. Finally I use a moisturiser to complete my skincare routine, either The Body Shop vitamin E night cream for evenings, or currently an Arbonne daily moisturiser for daytime.